CRIME, GUNS, AND VIDEOTAPE: The Chicago Police Pension System is in a Death Spiral. The Chicago Police Pension System is in a Death Spiral. Chicago, IL—Chicago’s politicians have steadily used the police pension fund as their personal ATMs looting millions. It’s no secret it will fail at some point soon. Were the board members asleep while this was happening? Were they complicit or just negligent? One thing for sure the pension was not aggressively protected or it would be solvent today. 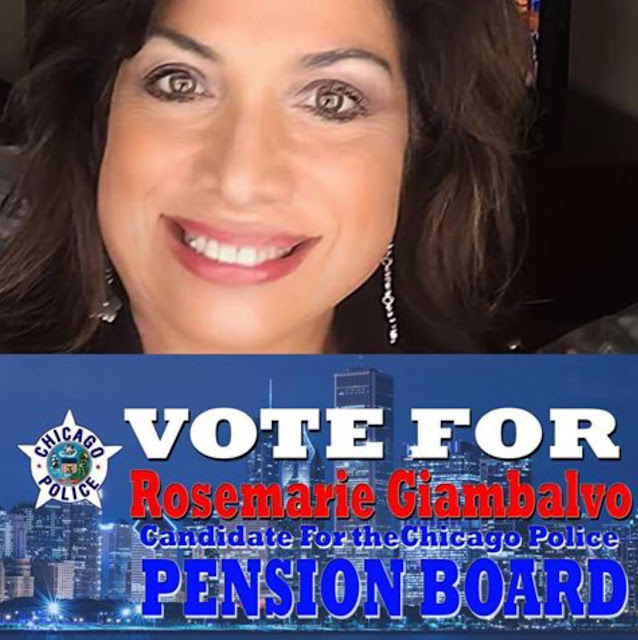 Retired officer, Rosemarie Giambalvo has fought for the rights of disabled officers for many years. She’s fought for retirees along with the disabled too. Ro really earned a spot on the Pension Board and now needs the votes to make it happen. I anticipate Ro flashing her razor sharp bulldog teeth and making life really miserable for those victimizing retirees. Ro will never get in bed with the city politicians and administrators. It’s long past time to bring new watchdogs to secure retirement of Chicago cops. Vote for Ro! Isn’t she the one on disability pension for a number of years?